I've found Simon Schama's trilogy very difficult to read, I think for three reasons. Firstly, he expects the reader to know a great deal about the subject, in very fine detail – it feels like a book for historians rather than the general reading public. Second, the language seems to me to be a rather flowery mix of the sort of old-fashioned "prestige English" that politicians habitually use when making announcements to the public and some "down with the cool kids" informality which I find gets in the way of picking out the important facts. Thirdly, the narrative jerks around constantly, going off at tangents that are too esoteric for my liking (see the first point). It probably all makes sense to better informed readers, and the number of four and five star reviews seems to confirm this. I'm going to look for a more traditional, systematic approach with a more rigid chronology rather than keep confusing my poor self with these books. I'm looking at John Burke's An Illustrated History of England to start with, maybe followed by Andrew Marr's History of Britain. My copy of Burke was published in 1985 so I should probably ask someone what new or changed information has since become available. 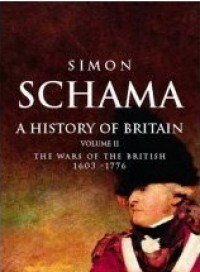 Hopefully I'll return to Simon's books later, armed with a clearer knowledge of British history.